Discover Geographic Features with Map of Mythflict! Our Map of Mythflict is back with a second edition, and a promotional campaign! Discover real geography in a fantasy world by putting together a two-sided puzzle of our unique setting. Displaying 31 geographic features, the 285-piece puzzle is of a map both in a full color side and a more challenging side in black and white. 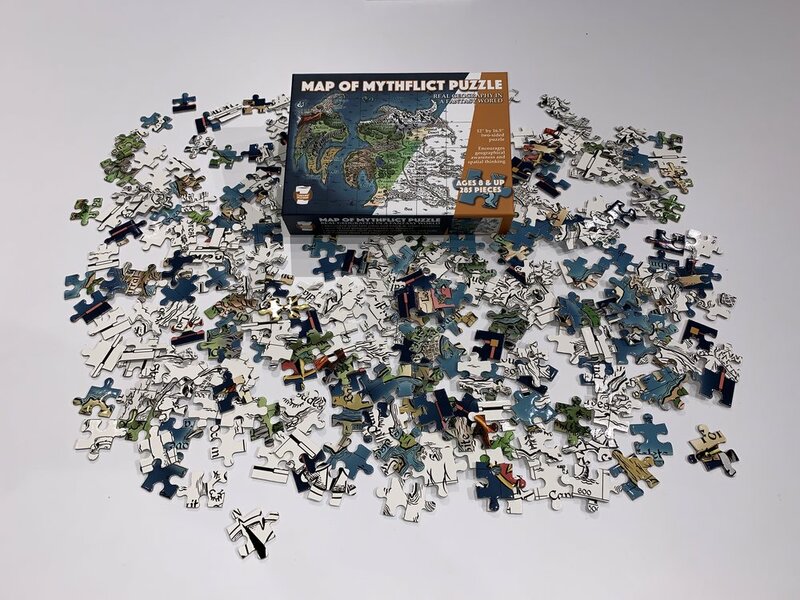 Our puzzle is great for ages eight and up as a way to interact with a map that shows core map elements, and see what these features look like that are pulled from around our world. Send it with a student to their elementary class to use with others in small group, or enjoy it as an adult as a way to relax alone and immerse yourself away from distraction. What’s more, we are also releasing a new shirt that pair well with discovery! Find A Place to Plot while wearing our new shirt. We are offering a 15% discount now (07MAR19) until 14MAR19. Order your puzzle here and shirt here! Mythical Creatures' Legendary Histories: Haiku A to Z Now Available! Our latest book is about mythical creatures and is presented using haiku! Readers can learn about the poetry form and then about 26 creatures from cultures around the world. What’s more, the book includes a foreword from creator of the comic Untold Tales of Bigfoot, Vince Dorse! Find it here and also at Amazon. Amazing Animal Actions: Alliteration A to Z Now Available! Our newest book is now available! Amazing Animal Actions: Alliteration A to Z uses 26 different pages of animals in alphabetical order, each displaying alliteration with use of action words. Buy a copy from us or find our book at Amazon. We received a review from Brittany Williamson on Instagram. She's a wife and mother of two boys, and former teacher that likes to promote educational toys through social media. She was kind enough to review our sight word game for first graders, SpellCasters VS: Goblins & Pixies! Our SpellCasters VS series are decks for students in grades from kindergarten to 3rd grade, and contain sight words that kids encounter in school. But what exactly are sight words? "I’m always looking for a thing to build, or draw, or make. Everything I do seems to tie into my creative soul. My career has spanned 30 years and has been connected with the art field in some way. I started out as a technical illustrator and then just moved about in the field doing everything from draftsman to graphic multimedia designer." As summer winds down, and we get ready to send our kids back to school in the fall, some of you might be squeezing every last drop out of summer. Maybe you're putting your kid on the back of your bike, or pushing them in a jogging stroller. Or maybe you're like me, and are just as active but it is much hotter now that you have some free time before or after work. Whatever the case, be sure to keep you and your family hydrated! Water is great, we all know this. But let's take a moment to discuss a drink that is somewhat of a well-known secret: pickle juice. The WiFi was down in my household yesterday. Once the kids returned from summer care for the day and raided the pantry for a snack, I told them instead of turning on a show I want them to listen to something. I put my phone on the table in the back room and played the latest episode of Wow in the World through Stitcher. I went back to check on them, and saw my daughter drawing and my son sitting on the couch with his bowl of Chex Mix. I asked them, "What do you think of the radio program?" Both were quick to respond. The younger daughter told me, "It's good!" and the older son expressed his surprise about the topic discussed. Wow in the World has since been requested while driving to summer care. We are a veteran-owned business cut of a different camouflaged cloth. So what better way to show this than with a promotion? We teamed up with Yoga Joes to do just that. We are offering one free Yoga Joe with every order! "I have been working as a designer and an illustrator for over 20 years. I have found myself at the heart of many projects ranging from corporate identity, brochures, handbooks, year reports, illustrations and other PR publications such as advertising material, web design and promotional films." As an organization that does good things for families and kids, we want to get the word out about what Our Military Kids does for the military community. So we spoke with SGT Eric Boeck of the Texas Army National Guard, about his experience with Our Military Kids!